Electric Race News: Who Cares If Electric Racecars Are Not As Fast As Gas Race Cars? Who Cares If Electric Racecars Are Not As Fast As Gas Race Cars? One of my colleagues over on PlugInCars.com (where I write news articles) wrote a piece that tried to diminish the need for electric racing. The thesis is a) the current crop of electric race cars is slower than gas race cars, b) what we need is longer range, not faster performance, and that fast electric cars will have a shorter range. There's a certain amount of "hmm, good point" to what he says. But then the commentators came along and made it clear that high performance is a desirable trait for electric cars and electric motorcycles. Just scroll down past the article and read the comments. Many of them say they disagree with that writer, if only because there are several kinds of needs that electric vehicles can fill. Not everyone needs to carry a lot of people or stuff, and some people legitimately want speed. Further, racing acts as a test-bed for technology development. As for the question at the top of this post... we recently had a historic win in the motorcycle category at Pikes Peak. 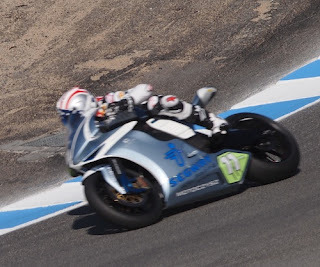 (see also on PlugInCars) This is something the electric motorcycle racing teams have been working towards for years - to win outright, against the best gas bike racers in the world, with an electric motorcycle. Preceding that win was years of development work. Years in which the electric motorcycle races were slower than the gas bike races. The electric motorcycle races were ignored and shunned in part because they were slower than gas bikes. To racers what matters most is the speed and capabilities. They don't seem to care about whether it's piston driven, or electrically driven or warp driven, they want speed. An electric bike, or electric car, that's dressed up as a race bike or race car, but is slower than the gas powered equivalent, that's just not interesting. Hence, as cool as the electric motorcycle racing has been the last few years it was slower than the gas bikes and was ignored by all but the most die-hard electric fanatics (like me). To answer the question at the top - it may not be important that today's electric race vehicles are slower than todays equivalent gas powered race vehicles. The last several years of electric motorcycle racing had exciting races, after all, even though they were slower than the gas bike racing. What does matter is to keep developing the technology. Soon enough the electric race vehicles will be faster, and with a few breakthroughs in battery technology they'll have enough range. It's just a matter of technology development. The problems holding electric race vehicles back from full parity with the gas powered race vehicles are all solvable.